Bonneville….left at Bonneville and over the darn dam…or is it dam dam…. I don’t think he is going to be able to go over the dam (security after 9-11). I have emailed Matt a suggested that he crosses at the Bridge of the Gods. sounds “greek” to me…..Bridge of the Gods……does it thunder and lighning as you walk across? HEY!! YOU IN THE BOAT.. UP HERE! Looks like a beautiful day to be out on a boat. I love the view in the background! I would love to go boating with the mountains nearby. That would be gorgeous! Are YOU crossing the White Salmon River or is it just the bridge that is crossing? Somehow, you don’t seem to be on any bridge! I mean from the angle, it would seem you are standing very near it, but not on it! Is it a railroad bridge? No sweat Karin since I am not walking…lol What’s even more cool is you can go to google map on this location and get a 360-degrees view of this very spot. Very serene! I can see why Hobo Matt stopped and snapped a pic here. I’m getting more homesick the farther west Matt gets. We did our annual white water rafting day on the White Salmon. Good times! Can’t wait for Matt to pass through Hood River and hopefully post some pics of the wind surfers. Hope he gets to see the Historic Columbia Gorge Hotel, too! Oh I had my best ever Thanksgiving Dinner with family in the Columbia Gorge Hotel (long ago). Awesome place! I know what you mean, Kherri, these pictures are making me a bit homesick as well. Matt is seeing some of the most beautiful scenery….can’t wait until he sees Multnomah Falls! Sorry guys. Matt is already past Hoodriver. 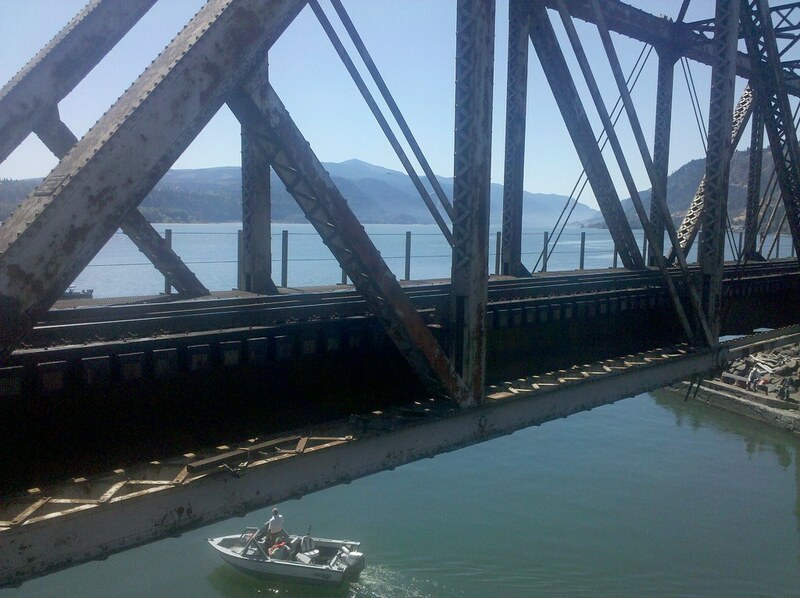 There is actually no good way to walk from Hoodriver to Cascade Locks where the Bridge of the Gods is. Only Freeway. 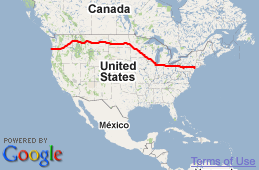 It will be difficult but not impossible to go west on the Oregon side from there. You are right. Multnomah Falls is coming up. Hope he takes the old scenic highway. Great, great views from there. Crown Point………….Oh my!!! That’s to bad he didn’t get any pictures of windsurfers or get to see the Hotel. Yeah, at least he’s getting closer to the Falls. According to his expected path he should be taking the old scenic highway (according to my memory of looking at it recently – but don’t quote me on that). I’m just so happy he’s finally in Oregon!!! I was going to buy some White Flesh Salmon from Alaska. Thanks for the reminder Matt. Beautiful – again – The water sure is pretty! Glad to see some live ones – to give scale! Pretty shot. Looks like mist rising over the river way in the background. And there’s those dang railroad tracks again. The walking route seems to follow along the train tracks pretty much your whole trip. But it all works well together. Thanks for the beautiful picture this morning/afternoon. How can a hobo be non hobo-nation? We must not discriminate. Honorary hobo non-hobo hobo nation members. So be it. Wow, getting really close to the end. Could this journey be over in a week?